'What's happening to me?' Successful translator and linguist Helga Rohra was understandably good with words - that is, until she found herself getting in a muddle when she spoke. She started to forget the way home, even though she could remember her address. Her confusing symptoms increased and Helga was diagnosed with dementia at age 50 - but she hasn't let herself be labelled with the usual stereotypes. With entertaining vim Helga shows that her life is still as abundant and self-determined as ever, dismantling the negative stereotypes that often surround a dementia diagnosis. She speaks frankly and with humour about her diagnosis and life with young onset Lewy Body Dementia. She explains the changes in her everyday life and the challenges she faces, and shares practical tips that prove it is possible to live well with dementia. Helga also talks about her activism work, which has made hers one of the key voices internationally in dementia advocacy. Dedication. Introduction. 1. Before the onset. 2. Summer 2008: There's something the matter with me. 3. Summer 2008: First visit to the doctor - "Go for a walk". 4. Why is early onset dementia slow to be recognised? 5. Spring 2009: University hospital - Waiting and hoping. 6. The diagnosis - I feel as if I'm falling. 7. About Lewy Body dementia and how it has been for me. 8. Summer 2009: At rock bottom - and first aid from the Alzheimer's Society. 9. Doing battle with the bureaucrats. 10. Appointment for assessment. 11. Autumn and winter 2009: Helen Merlin - "Speaking for myself". 12. Shame or difficulty in being open about the symptoms. 13. January 2010: "THIS MAKES SENSE!" - I step out of the shadows. 14. March 2010: Thessaloniki - on my own. 15. My everyday life and how I cope with it. 16. March 2010: I am elected to the board of the Munich Alzheimer's Society. 17. Spring 2010: The media. 18. 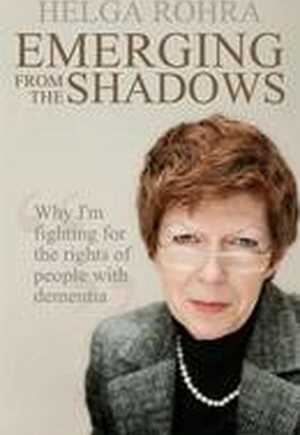 Speaker at a congress on dementia: Why many people I speak to declare that I am well. 19. July 2010: At the golf course. 20. Why it's wrong to compare people with dementia to children. 21. Things that I would like people to do when interacting with people with dementia. 22. Invisible hurdles in everyday life. 23. Conferences - Talks - Events. 24. Visibility and the "Dementia Card". 25. Mulling over my favourite topics. Acknowledgements. Afterword.